Kumail Nanjiani’s new film, The Big Sick, has put Pakistan on the world map. At last, Americans can see us Pakistanis for who we truly are rather than falling back on the usual stereotypes. Like other people the world over, Pakistanis are nuanced and complex; we have our quirks and our prejudices. We’re human and multifaceted, not cardboard stereotypes playing our assigned roles… Right? Surprisingly, wrong – at least in the context of this film. The Big Sick, written by the immensely talented Nanjiani and his wife, Emily Gordon, is the semi-autobiographical account of how their eleven-year relationship began. Kumail (who plays himself and initially found fame playing software engineer Dinesh in TV’s Silicon Valley), is a struggling stand-up comic who first meets Emily Gardner (played by Zoe Kazan) when she heckles him during a performance. They start dating, quickly become serious, and then break up when Emily realises that Kumail has kept their relationship hidden from his conservative Pakistani family. In a sudden twist of fate, Emily becomes critically ill and Kumail is left to deal with her parents (played by Ray Romano and Holly Hunter) as the awkward ex-boyfriend in an already high-stress situation. The film has a stellar American and South Asian cast, joined by the likes of real-life stand-up comics Aidy Bryant, Bo Burnham, and Kurt Braunholer, who play Kumail’s friends. One can easily see why The Big Sick has been so well-received by Western audiences and critics. With Michael Showalter at the helm and Judd Apatow as producer, how could anyone not agree with all the reviews that hail it a “charming crowd-pleaser”? Unfortunately, it really depends on the crowd. The Big Sick is a film about a potentially explosive cross-cultural romance, raising the question of whether truly meaningful relationships can take place between people from disparate backgrounds. Ultimately, the film affirms that such relationships are not only possible but highly successful, too. However, the same doesn’t always hold true for audiences, particularly when much of the humour in The Big Sick relies on the vagaries of race and religion. 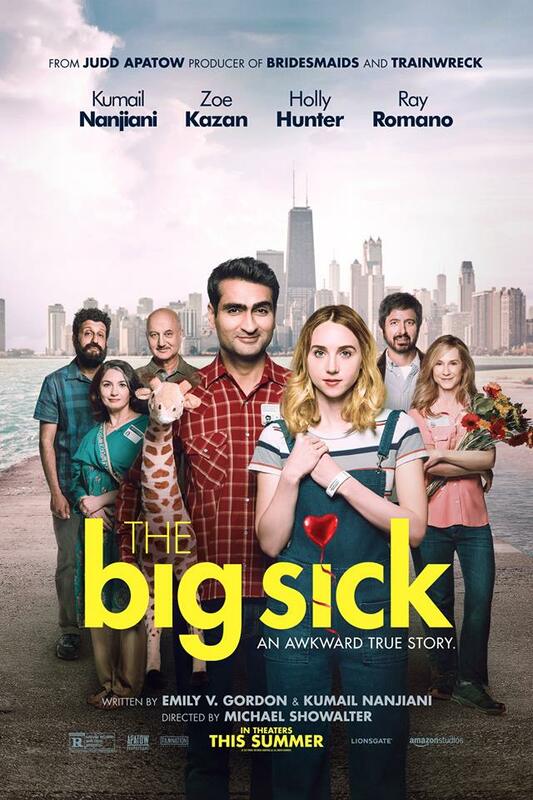 One of the reasons why the depiction of South Asian characters doesn’t ring true in The Big Sick is the fact that desi audiences, accustomed to fairly sophisticated Bollywood cinema over the years as well as a new generation of interesting Pakistani dramas and films, have a far more evolved understanding of their own fictional portrayal. Take, for example, a film as nuanced and powerful as Sharun Baktra’s Kapoor & Sons, where the main character has to tell his family that he is in a committed relationship with another man. The kind of exaggerated portrayal we see in The Big Sick is alright in slapstick comedy where everyone is equally ridiculous, but unforgiveable in a film where the treatment of white and brown is not even-handed. The problem is, as a Pakistani, I really, really wanted to like this movie. It truly has done something groundbreaking: not only is the central character in this mainstream American rom-com a Pakistani, Pakistan itself features prominently (and positively) throughout. In fact, the country is brought into ironic focus in a very literal way, when we see flashes of Kumail’s self-conscious, poorly-received one-man-show on growing up in Pakistan. Maybe, as is often the case, the writers had to make compromises so the film could hope to be a viable commercial success. In so doing, however, they have only confirmed the stereotypes that we’ve lived with for far too long. Hopefully, films like this will pave the way for more nuanced representations of South Asian culture in American cinema, and that in itself is no small achievement.